KEEN paddlers are using pumpkins weighing more than 200 pounds to race each other in a local regatta. 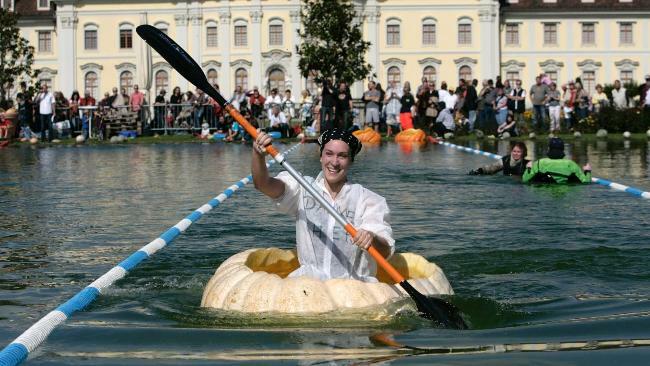 And there's certainly nothing more fruity than a water race using giant pumpkin as a boat. The Kürbis Regatta at the annual Ludwigsburg Pumpkin Festival, in south-west Germany saw a host bloated specimens being paddled in front of a former royal palace. Much of the fruit – and yes they are indeed fruit, botanically-speaking – weighed in at over 200lb before having all their flesh scooped out so that racers can fit inside. But the festival also sees a more traditional contest where gardeners around Germany see if they can grow record-breaking pumpkins.